Includes a 5-device, 1-Year license. Plus get O&O DiskImage 10.5, worth £32.99 for FREE! Kaspersky Total Security 2019 is a powerful suite of malware-hunting, anti-hacker, web safety tools. There's antivirus. Browsing protection. A firewall. Exploit protection. A vulnerability scanner, parental controls, webcam and audio protection, online transaction protection, and more. These features have real value, too. Independent testing labs such as AV-Comparatives typically rate Kaspersky as offering some of the best protection around. The Software Updater checks for updates to common applications (Adobe Reader, Flash, Java, Chrome, Firefox, more), and can optionally install them without you having to see or do anything at all. A "Secure Connection" feature is essentially a privacy-oriented VPN (virtual private network), automatically kicking in to protect you when using wifi hotspots, web banking sites and more. An Installation Assistance tool looks out for adware and other pests that get silently installed with some "free" software, and the Software Cleaner helps you decide what to remove. 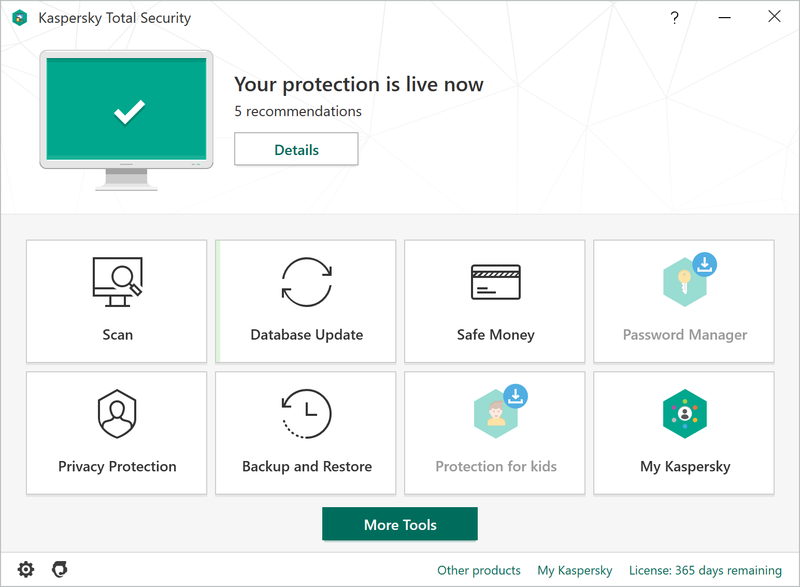 What's new in Kaspersky Total Security 2019? Your computer is now protected whilst it's either booting or restarting, there's better protection against third-party manipulation of files on your hard drive, additional notifications to warn against potential malicious websites and, for any reseller, Kaspersky has made it much easier for a user to be able to add a new licence to an expired subscription rather than forcing the user to renew. BONUS! We're giving our Kaspersky customers, who purchase from this store, the powerful backup (and restore) application, O&O DiskImage 10.5 Professional, with a 1-PC licence, worth £32.99, for FREE! Use this Windows 10-compatible to backup either your most important files, or an entire drive, for either a quick restore or migration to a brand new computer. Includes a 5-Device, 1-Year licence, now with support for 2-Accounts! What does this mean? Kaspersky Total Security 2019 5-Device now includes support for 2 Kaspersky accounts, so two separate people can now use Total Security to activate their devices (up to 5 in total). You receive a single license with Kaspersky Total Security 2019 which can be used on TWO separate Kaspersky accounts! 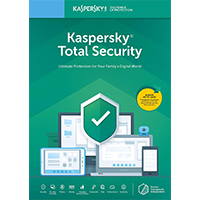 Your license can activate Kaspersky Total Security 2019 (PC), Kaspersky Internet Security for Mac v19 and Kaspersky Internet Security for Android (Android).